Forming linear or irregular whitish yellow to pale spots, often entirely discolouring the leaves and deforming the host. 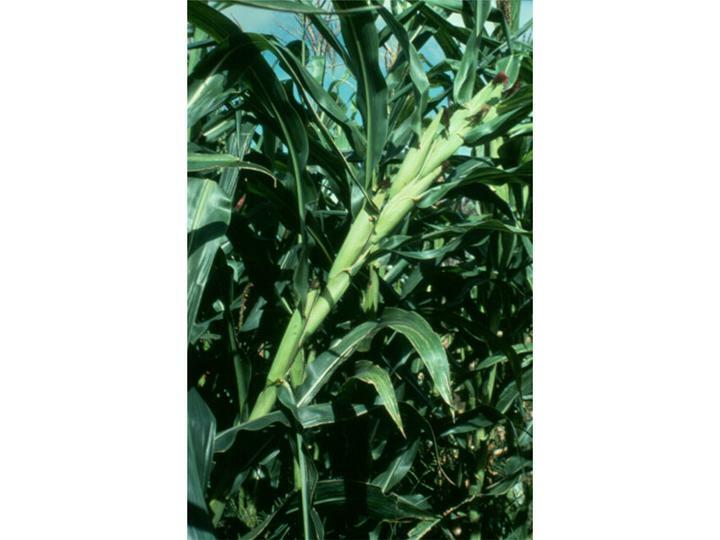 Extremely destructive to maize (Waterhouse 1964). Mycelial hyphae growing intercellularly in all parts of host except roots, branched, slender, approx. 8 µm in diam., but irregularly constricted and inflated, haustoria simple, vesiculiform to subdigitate, small, about 8 µm long and 2 µm in diam. Conidiophores always produced in night dew and growing out of stomata, erect, 350–550 × 15–26 µm, bearing a basal cell in the lower part. Basal cell with few knobs and slightly expanded at base, 140× 5–8 µm, usually exceeding or equalling the extent of the main axis from the septum to primary branches in length. Main axis usually expanding abruptly above the septum to a greater width, 22–32 µm and constricting noticeably to about 20 µm below the branches, dichotomously branched 2–4 times above. Branches robust, sterigmata conoid to subulate, 13 µm long, straight. Conidia elongate ellipsoid to cylindrical varying in size, usually 39–45 × 15–17 µm, hyaline, with thin episporium, minutely granular within, thin wall, slightly rounded at the apex lacking papilla, rounded base with a minute apiculus of attachment, germinating by tube. Oospores unknown. (Waterhouse 1964). McTaggart, A., Cumagun, C. (2007) Downy Mildew of Maize (Peronosclerospora spontanea) Updated on 2/4/2008 3:00:07 PM Available online: PaDIL - http://www.padil.gov.au.